We love London in the winter. 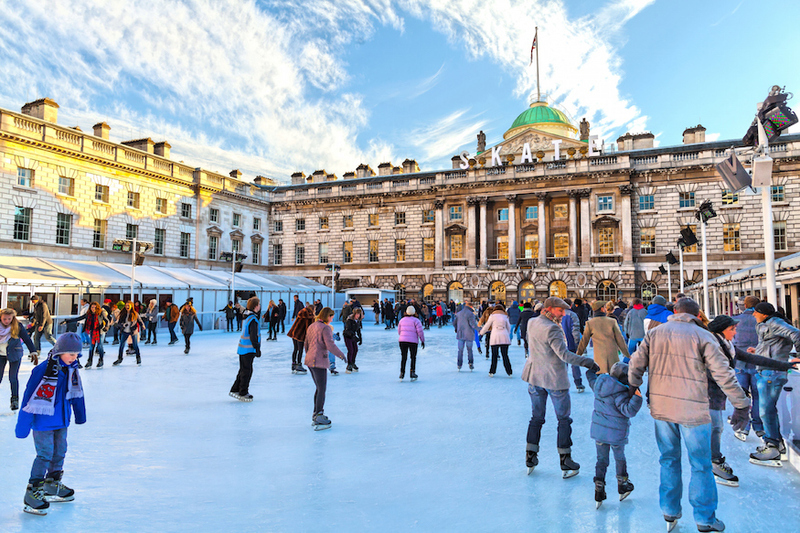 If skating's your thing, you're in the right place, as we've rounded up the best Christmas 2018 ice skating rinks in London. Looking for other festive things to do? Take a look at our Christmas in London page. 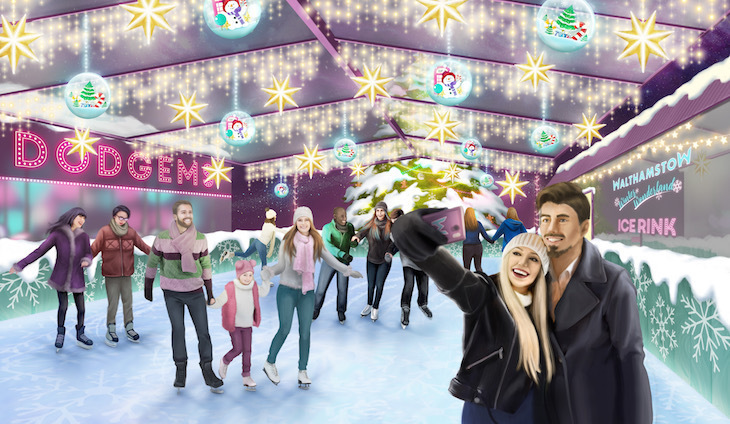 A rooftop ice rink is coming to John Lewis on Oxford Street for the first time, in an attempt at recreating the frost fairs that graced the frozen Thames in the 17th century. Expect a bit more luxury here — think winter cabins for hire, a gin-heavy bar and warming pies available to buy. This South Kensington ice rink is always the first to open for the season, in time for October half term. Skate around the 30ft Christmas tree in the courtyard of the museum, surrounded by fairylit trees. Not a skater? No problem — the cafe bar and balcony, run by Benugo, offers a view over the ice rink while you sup on a hot chocolate or mulled wine. The large ice rink is back in Canada Square Park, in the shadow of the skyscrapers. The skate path through this trees hasn't returned this year, but the path running alongside the rink still looks fantastic. We're promised exciting new activities including winter sports this year — keep an eye on the website for details. It' a long-running rink, opening in the autumn and running right through until February half term. 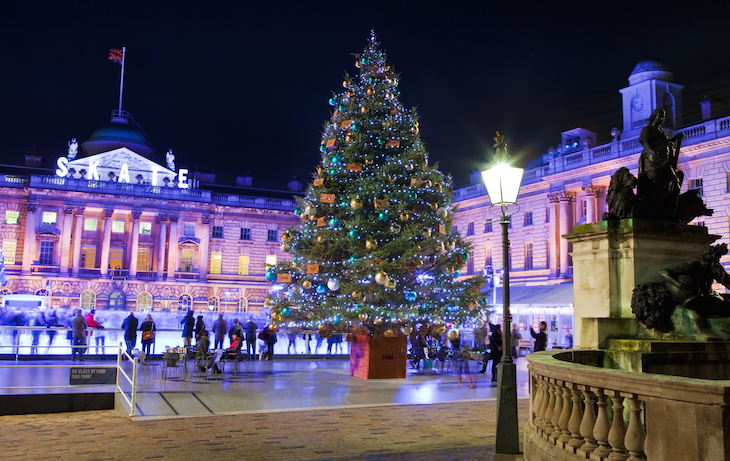 The courtyard at Somerset House will be frozen over once again for the Fortnum & Mason ice rink, centred around a 40ft tall Christmas tree. Look out for the special club nights including appearances from nightclub Total Refreshment Centre, plus skate school, and Alpine-themed Fortnum's Lodge. New for 2018 are collaborations with the Charlie Brown and Peanuts exhibition, and an 'artistic commission' from artist and ice skater Ruth Proctor. Somerset House, 14 November 2018-13 January 2019. 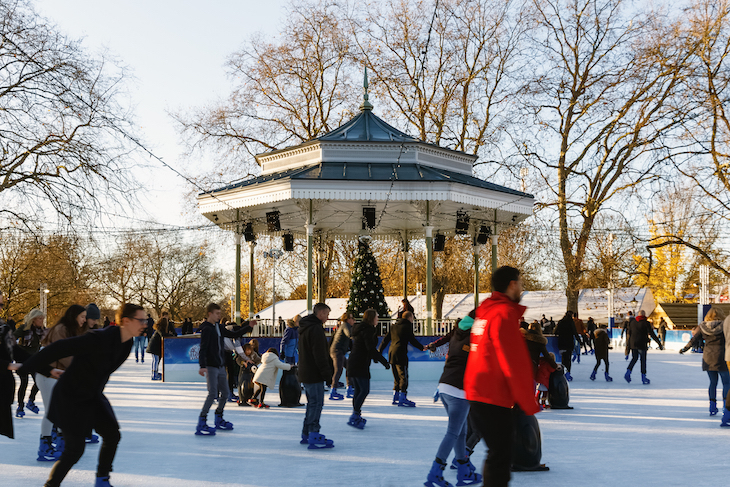 Popping up in Clapham Common, Winterville is home to an ice rink alongside its fun fair and street food stalls. It's made from real ice and is open Tuesday-Friday evenings, and all day Saturday and Sunday. Be warned, there's an extra charge of £2 for the use of a locker while you skate. The ice rink at Winter Wonderland is normally set around the bandstand, with a fairy light canopy, and acoustic musicians serenading the skaters on evening sessions. For atmosphere alone, it's one of our faves, and it also claims to be the largest open air ice rink in the UK (it does get busy). Of course, you have to battle through the madness of Winter Wonderland to get there, which loses it a few points. 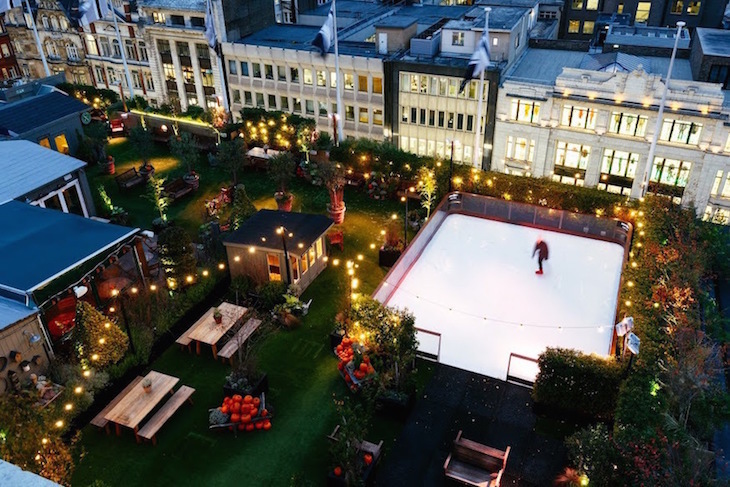 It was only a matter of time before ice rinks on London rooftops became prevalent. 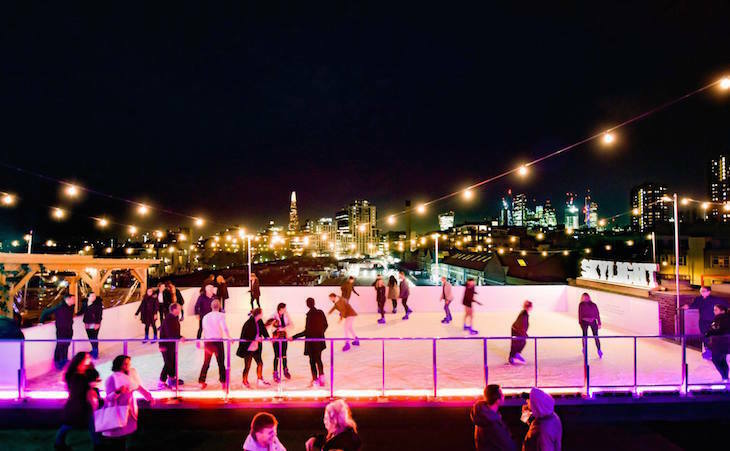 The chosen rooftop is Tobacco Dock; skylight is a free entry winter venue (charge for ice skating) with food, drink, and that all-important ice rink. Full details for this year are yet to be announced, although fondue and ice hockey are mentioned — keep an eye on the Skylight website. Take to the ice in the moat of the Tower of London, with a cafe in an adjoining marquee, and snowflakes projected onto the castle walls. 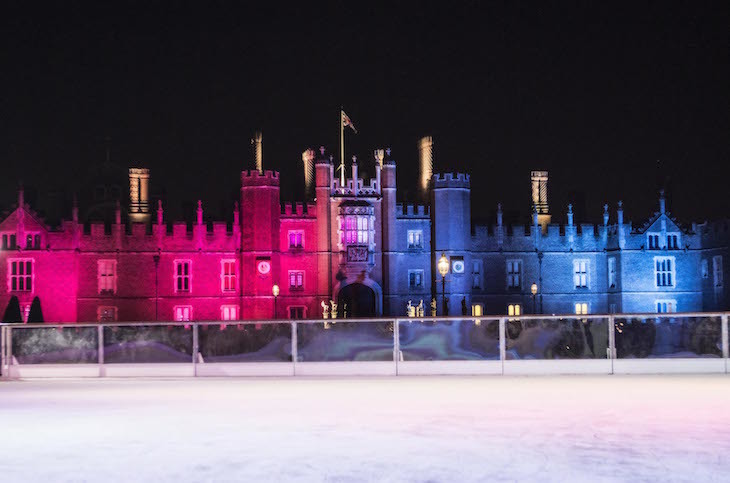 The Tudor backdrop of Hampton Court Palace makes a fantastic setting for taking to the ice. Once you've glided and twirled to your heart's content, warm up with mulled wine, other hot, cold and alcoholic drinks as well as festive snacks at the Ice Rink Cafe & Bar. 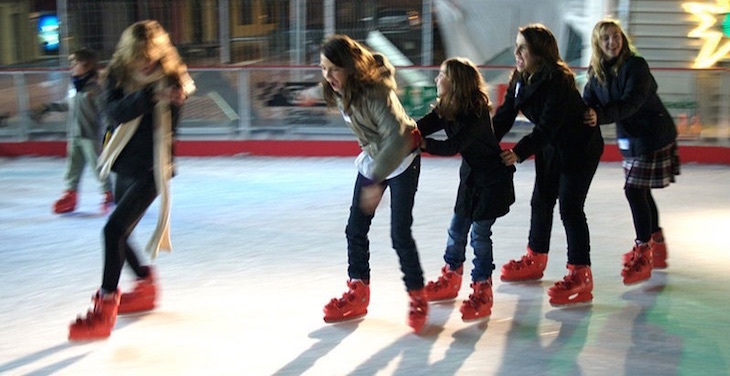 Sure, you could ice skate, but why would you when the alternative is bumper cars on ice? The rink, at Castle Square, also hosts festive film screenings and themed skate nights. Walthamstow Winter Wonderland is a new Christmas festival for 2018. Among its fairground, stalls and Santa's Grotto, we're promised an ice rink. The CGI images show it as an indoor rink, so keep it in mind for bad weather days — and with a capacity of 95 people, you're going to want to book in advance. Note: prices may vary by peak/off peak sessions, and many get booked up in advance, so plan ahead. See individual venue websites for price and booking information. Looking for other things to do with kids at Christmas? Take a look at our guide to Christmas 2018 in London, including Santa's grottos, winter light festivals and Christmas film screenings.